We offer full-service training based on your business needs. 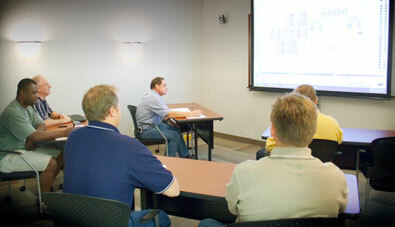 Graphic Marking Systems provides custom training solutions based on your organization's needs. We have spent the past 18 years teaching people how to make the most of digital printers and finishing systems. Ask yourself "Are you too busy driving to stop and get gas?" Although most systems are easy to figure out the basics, most people are too busy producing and never get a chance to learn more than the basics. Knowing how to efficiently use both the software components and finishing techniques can make valuable contributions to your bottom line. We can provide advanced training too. Offsite, On-the-Job Training: We instruct beginners using training outlines that we developed that cover the basics. We also sell tools such as software training CD's that people can use and refer to that explain the software tools and functions. However personal instruction will be focused around your specific design and production needs. Advanced Gerber Training: Unlock the potential of Omega and the Edge by embracing more complex projects based on your organization's markets and needs. Some of the more advanced subjects include producing control panels and membrane switch overlays, complex trapping, variable data, bar codes, back slitting, printing on the liner, etc. Finishing Systems: This is one of the areas that is the least understood and the most profitable. It can mean the difference between a marginally profitable and highly profitable job. Learn about the different tools and accessories that cut labor from your bottom line and enhance your product offering. Sales Training: It's true that most people don't know what thermal transfer printing is. So how do you sell it? Learning what the benefits of thermal transfer are is the place to start. Understanding what jobs are right for your equipment, and what jobs you should hand off to another production method is information you need to know! Estimating: How do we know estimating? We write the spreadsheets and software. Our E$timator program will deliver accurate figures for material use, production time, and of course, all associated costs. Give us a call and let us tell you what your jobs cost to produce on the Gerber system.